In this tutorial sequel I will demonstrate and guide you how to develop a Module extension for Joomla 1.0.x and Joomla 1.5.x. For efficiency and save time, we will use Joomla Module Generator / Wizard plugin for YouCMSAndBlog IDE which you can download from Download section at VivoCiti. For you who use other editors, I believe you should still be able to follow this tutorial. Let's start ! 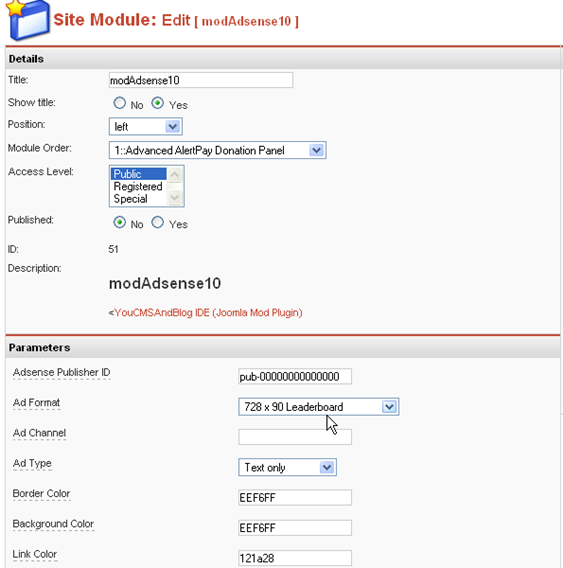 Module extension in Joomla is very simple to develop yet flexible. Flexible is because Module extension can be positioned in anywhere at your Joomla website, i.e. top of the front page or every page, left, right, bottom or user defined positions (user 1, user 2, and so on). 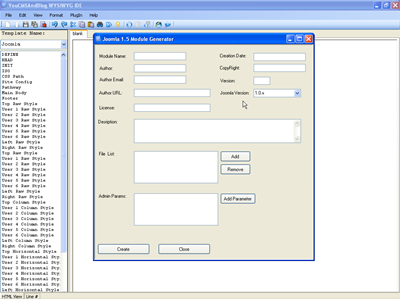 Provides pages interface for user to input some data, defining a complicated flow from one page interface to another page interface because this sort of features will be handled more nicely and easier by a Joomla component extension. Launch YouCMSAndBlog IDE and click on "PlugIn" menu and select "Joomla Module Generator"
You can easily type in all nessesaries information about this new module by following below screenshot (on Module Name, Author, Author Email, Author URL, CopyRight, Author , License and Description textbox you can fill in with your own information). For Joomla version we are going to develop for this moment let's use Joomla 1.5.x by clicking on "Joomla Version" listbox to select "1.5.x"
For "File List" section we will not add any files so we will skip this box. We will add several dynamic parameters to our Module in order to let our users to be able to change them from Joomla Administrator page. But before that, let's me explain the background what sort of parameters we want to add. Let's put attention on all part which I have made it bold. You do not want to hard code those parameters in your module. 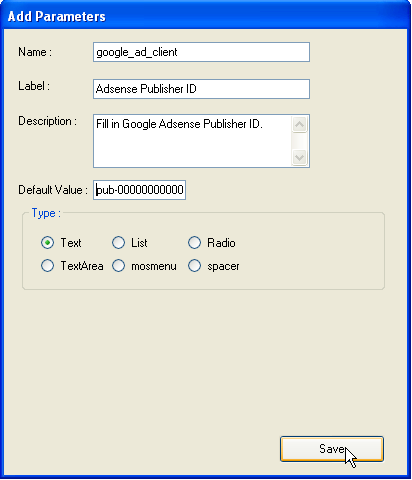 Especially for "google_ad_client" which is your Google Adsense Publisher ID. You want to develop a module so you can share it with other Joomla users and let them using your proudly created module for Adsense. So how do we provide a flexibility for them to change all those bold part dynamically ? Well, this is where Joomla parameter come to help. And we will provides those parameters so our users can set their own Google Adsense publisher ID, text color, ad format and so on after they install this module at their Joomla CMS website. Let's go back to YouCMSAndBlog editor screen again. 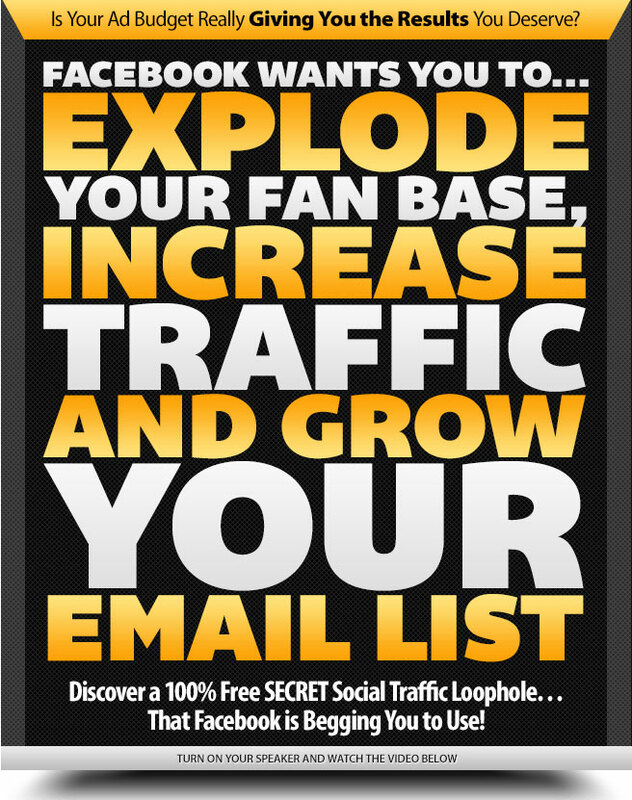 We are going to create those parameters in following steps. 8.1. Fill in all information as shown in screenshot below, under "Type" section you can select "Text"
8.2. 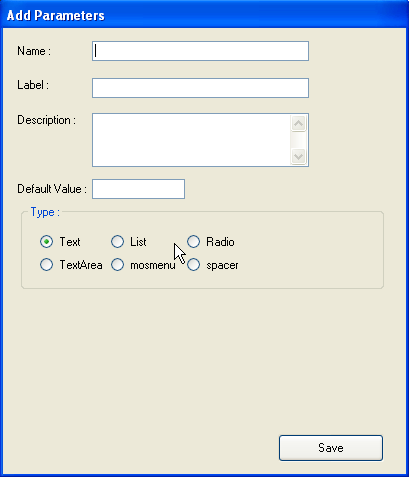 For "Default Value" text field, you can fill it with any default value if you wish to, i.e. 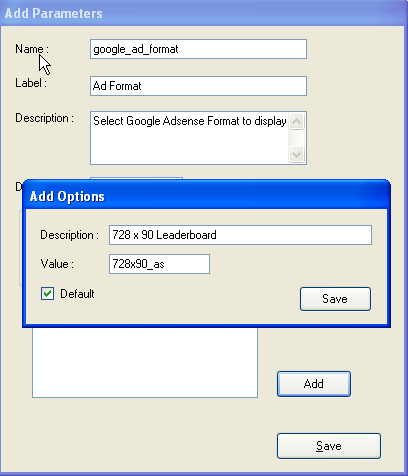 your own Adsense Publisher ID. 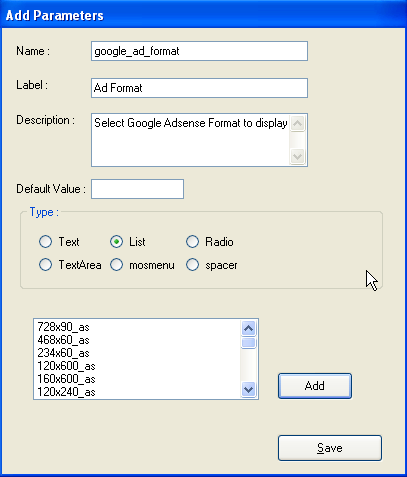 Next parameter will be : "google_ad_format". Since Google Adsense provides various Adsense format, we will provide the same by using another type of parameter in Joomla, which is List. You can click on "Default" checkbox if you want this option to be the default option displayed later on Joomla admnistrator page. Ad Channel Fill in Ad Channel ID if you have one. Leave it blank if do not have. That's All ! Now you can click on "Create" button. 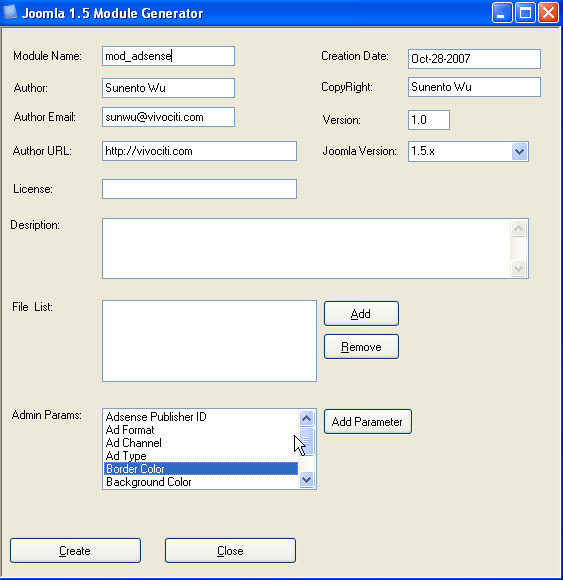 Joomla Module Generator will ask you to select a destination folder to generate modAdsense module's folder with its XML file and its PHP file. I will leave it to you to select your own local folder. Congratulations ! You have created a module in Joomla. 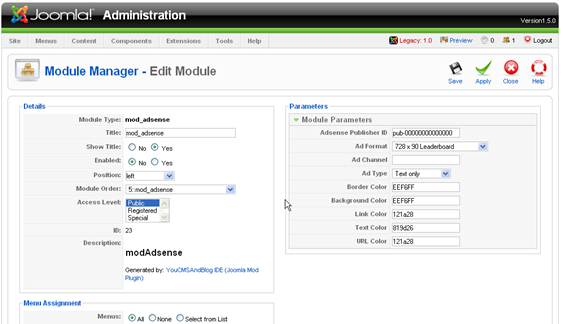 Change Module Name Textbox from "mod_Adsense" to "mod_Adsense10"
Click on "Joomla Version" listbox to select "1.0.x"
You can click on "Create" button again and repeat Step 13 to 14. You have created the same module but for different version. 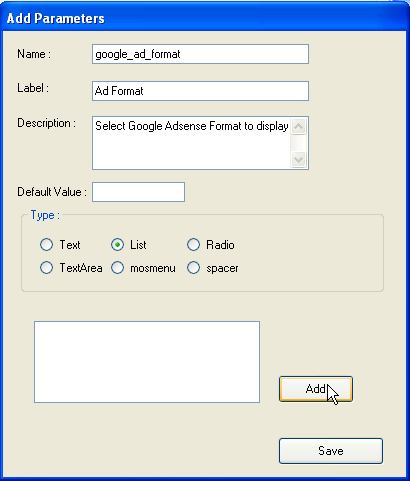 //Fill in Google Adsense Publisher ID. //Fill in Ad Channel ID if you have one. Leave it blank if do not have. //below is our customised / additional source code to get width and height. //you may use regular expression or explode for simplicity. 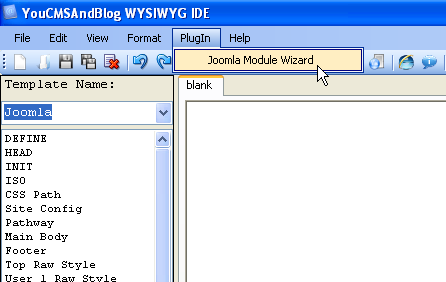 That's all about Joomla Module Generator / Wizard Plugin. You can download the full module for Joomla 1.5.x and Joomla 1.0.x here . Hope it is useful for you. And if it is yes, please Digg It or tag it to del.icio.us through small icons link on top right corner of this article. Share it with others. See you for the next tutorial series. We will go through development of Joomla plugin or mambot. And some other Module tutorial but for next time, I will explain how to deal with database queries by using Joomla internal Database helper class. So stay tune and do not forget to subscribe to VivoCiti's newsletter for you who have not done so.